With the use of our professional garage door repair services, you will have a door system that operates effectively, safely and securely. For each and every malfunction that occurs, there will be a solution. It is always best for a repair to be organized soon after an issue has been identified to prevent further damage. If the problematic component is damaged beyond repair, we can replace with a new part. We will do everything necessary to restore your door's optimal condition and operation fully. In the event your garage door cable or spring has snapped, you can rely on our emergency, fast-response service. We'll get to you as soon as we can that you can use your door as needed as quickly as possible. All our technicians are professionally trained specialists who keep up to date with the latest industry trends. We use advanced techniques and our expertise when undertaking a job and will come prepared to carry out the job properly. 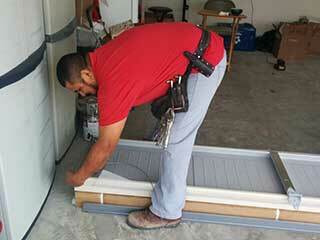 We service most types of door including steel, wood, and vinyl. We can also fix damaged panels. Opener repair is another common service that we offer. We'll troubleshoot all kinds of possible issues, from a broken moving gear to a failed motor or circuit board. We can also work with any opener drive system, whether you've got a chain, screw or belt drive type. Lastly, our service always includes a check of the safety sensors and reversal function system to ensure the system is safe to use. Our professional maintenance service is designed to ensure you're working with a safe and effective door at all times. We'll do everything from safety testing the opener system, to lubricating and adjusting the moving parts. In our experience, preventative maintenance work like this is always better than waiting for a more serious breakdown.